Who’s On Your Development Team? A developer pursuing a real estate deal needs a lot of resources to complete the project. The developer must have the ability to collect his or her thoughts and convey them to the intended audiences to obtain those resources. What does the developer need most? Perhaps one of the most important elements of a successful development project is a like-minded, coherent, and compatible team. Yes, the funding is necessary. Of course, a project’s architectural elements define the area. And, if the marketing and sales team falls short, nothing gets sold or leased. However, would any individual facet or component of a development team truly work in an autonomous role? The single most important element of any Development Proposal is the developer’s recognition that he or she must rely on other professionals to complete the project. The selection of top-notch and proven team members illustrates a developer’s ability to look past himself or herself and understand that the best professionals will help to build the best project. Financial projections can be altered. Fancy drawings can mislead. Stories of windfall profits can be exaggerated. The constant in any development – through the ups and downs – will be the team of professionals committed to the project’s success. Every successful development project begins with a vision. What will the project become? Who will it serve? What public and private benefits will be achieved? A large-scale real estate endeavor doesn’t come to fruition overnight, and a single individual doesn’t complete it. Rather, it takes dozens of like-minded professionals – all sharing a joint project vision – to make any development a reality. From the capital investors to the lead architect to the marketing firm, if all involved parties to not fully commit to the vision and objectives of the development, success will not be optimized. Of course, professionals are paid for their services, but a significant development goes beyond an hourly rate – it engulfs the minds of the team. All of the intricacies and details associated with a large scale development project become the foundation of great projects. That said, even with a shared and unified project vision, it is up to the lead developer to choose the professionals best suited for the task. Once the team is selected, it is critical that the developer trusts his team members and fully commit, just as each professional should fully commit to the project initiatives. Choosing the right team should be outlined in the developer’s initial Development Proposal. A clearly visioned project team will illustrate the developer’s acumen for building a strong team in addition to developing a successful project. Still compiling your development team? 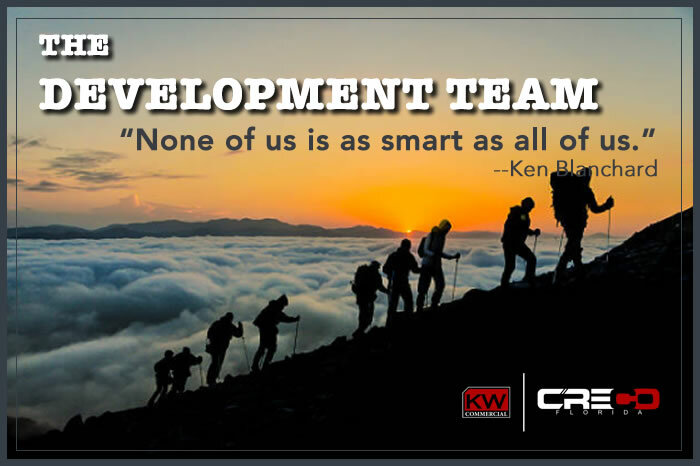 Consider adding Keller Williams Commercial Real Estate as your marketing and sales partner. With over 180 offices around the world, you’ll be able to leverage the breadth of the nation’s largest real estate network to maximize returns on your development investment. Contact ustoday to discuss the best way to optimize your development strategy.